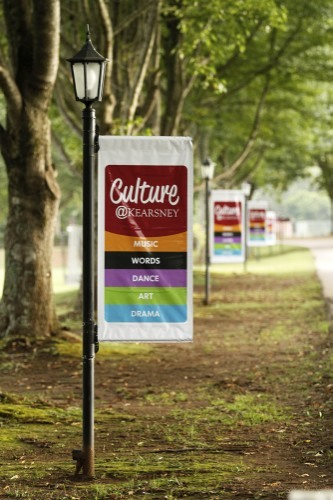 I was recently asked to open the new venture of Culture@Kearsney College. In essence this means that Kearsney would like to showcase the talents of all high school children. They are wanting to provide schools a platform to allow children the opportunity to benchmark themselves against others. The focus would be on participation rather than competition. There would be no losers nor winners. A different and very much needed new outlook indeed. The evening began with subtle musical tunes being played whilst folk viewed the art from various High Schools in and around Durban. Some really good pieces! The Choir got me going with a dance in my step whilst the beat of the drum reverberated into my core. I was reminded of the pull that art has for me. The goosebumps felt when I stand before my canvas as a conductor does before the Orchestra, conducting the many instruments of possibilities. HURRY! If you are in the area, you can still see the Art Exhibition inside the Greyhound Pavilion until 15 March. On week days it will be open from 09:00 to 16:00. The Art Exhibition will be followed by photography under the support of the Mathew Willman Visual Arts foundation before going into the dramatic nuances of the Performing Arts. Singing and Dance will tantalise and inspire many I am sure. The successful Battle of the Bands will take place under this culture@Kearsney and finally the Arts and English language curriculum will overlap in the slam poetry events. Well done to the initiators of this project. The Arts and Culture team headed by Andrea Fripp with Jolene Ostendorf, Kearsney Clubs and Culture, Senior and Junior Art teacher Glenda Pitcher and Tracy van den Aardweg and principal Mr van den Aardweg. What incredibly passionate people. Insightful and determined to bring about a balanced generation of young people. This entry was posted in Uncategorized and tagged Culture, Kearsney, Mathew Willman. Bookmark the permalink. Post a comment or leave a trackback: Trackback URL.